I received a copy of this book through Goodreads' First Reads program! An absolutely amazing thriller! Adam Gittlin uses deeply interesting character, infuses history into the plot, and then sprinkles pop culture on top to create one of the most addicting novels I have had the pleasure of picking up! His main protagonist is Jonah Gray- a high-end commercial real estate broker in the heart of New York City. Following in his father's foot steps in every facet of his life, from his business ethics to his taste for fine things, Jonah finds himself acquainted with some of the city's highest rollers, the best of the best in business and the luckiest in life. While the reader follows Jonah around in what becomes a life-changing series of events, they get to know all sorts other characters, some of whom show their less-than-desirable sides, while others show that there really are good people still in powerful positions in the world. We become very familiar with Gray's business partners- the tough, successful leader Tommy, Jake, the partner who is rarely serious, but will go for the throat to close a deal, and the hard-headed, subtly alluring Perry. Stan Gray, Jonah's father, is his only remaining family since his mother died when he was young. A top gun in real estate, his father is Jonah's best and worst critic rolled into one, all in the name of helping his son succeed. We meet friends L and Andreu, who seem upon finishing the novel to be the respective angel and devil on Jonah's shoulders. I absolutely loved all of the characters, not just the select few mentioned here. Even the more minor characters, such as his father's chauffeur Mattheau, Angie, the girl Jonah finds to be too good to be true, and Parker, Jonah's doorman, prove to be multi-dimensional and the author allows them their own side stories and lives for the reader to be sidetracked into. Another amazing aspect of this novel is the author's use of history in the plot. The first major problem the protagonist faces is when a stolen Faberge egg is planted on him at a party. This opens up doors to Russian and art history that is solidly visited throughout the novel and creates the central story line. 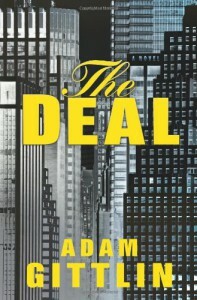 I had only heard of these Russian treasures in passing, but "The Deal" explores their whole history, substituting a bit for the sake of the story, and exposes the reader to knowledge they may never have had the pleasure of possessing otherwise. For that, I am grateful to Mr. Gittlin. Finally, Gittlin sprinkles popular culture all over throughout the novel to draw readers in to something they already are familiar with. This also serves, in my opinion, to show the reader that there is some similarities between them and this larger-than-life lifestyle the characters possess. While the reader may not have millions in the bank and maintain an honorable position in one of the largest and most successful real estate brokerage companies in the country, they can still appreciate the "Everybody Loves Raymond" reference, that the protagonist also listens to Beastie Boys, Rage Against The Machine, and Coldplay, or that he also has read and internalized Shakespeare and Edgar Allan Poe. If the reader can not connect to the characters' lifestyles in no other way, this serves as a great way to remember that they are just as real(as far as the novel is concerned) and the reader. I am very excited that I got to read this novel. The mystery and suspense kept me from putting it down multiple times. I give it five out of five stars and would absolutely jump at the chance to read another novel by this author.